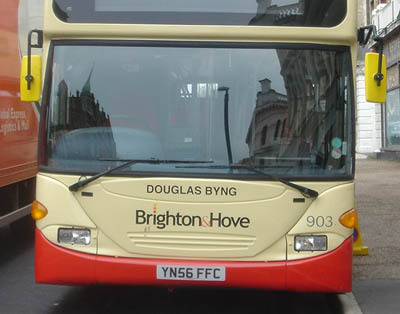 Connections with Brighton and Hove : Douglas Byng had one of the longest careers ever on the stage; lasting 72 years and Noel Coward described his nightclub act as 'the most refined vulgarity in London'. 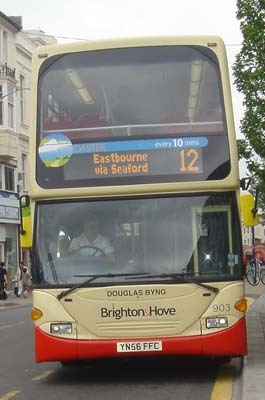 Although Byng was born in Nottingham, and often appeared in the West End, he is more associated with Brighton than anywhere else. Born in 1893, he came to fame in the Twenties with C B Cochran’s revues in London before becoming the darling of the smart set in cabaret. He also appeared in Monte Carlo and New York. 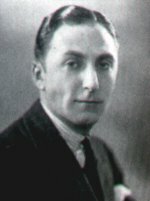 Byng entertained the troops during the Second World War, touring in North Africa and the Far East. In the Fifties and Sixties, he topped the bill in many comedies and musicals. He also made films, notably Hotel Paradiso with Sir Alec Guinness and he recorded songs. 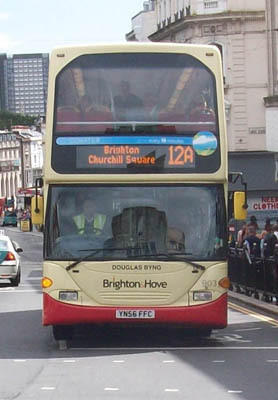 Byng moved to Brighton in the early Sixties and lived in Arundel Terrace, Kemp Town until his death in 1987. He was friendly with other Brighton actors and actresses including Lord Olivier, Dame Flora Robson and Dora Bryan. 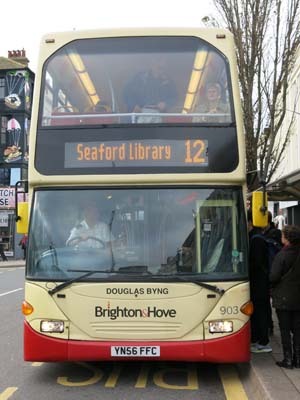 He wrote a biography called As You Were, devoting the last chapter to Brighton, and he often appeared on chat shows such as Parkinson and Wogan. 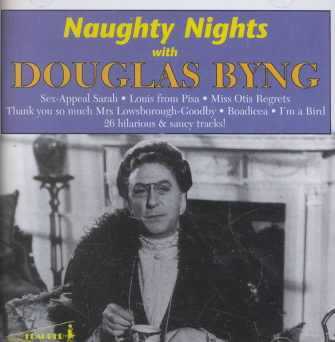 Douglas Byng appeared in a revue called Those Thirties Memories with Billy Milton at the Pavilion Theatre in Brighton in 1986. Later that year, he gave his last stage performance with a one-man show at the National Theatre to a sell-out audience. 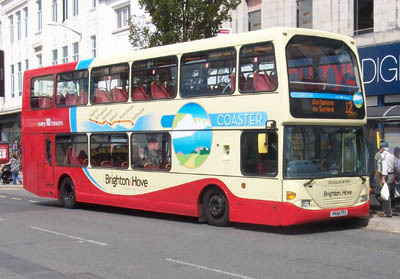 After cremation, his ashes were scattered outside his home in Brighton. 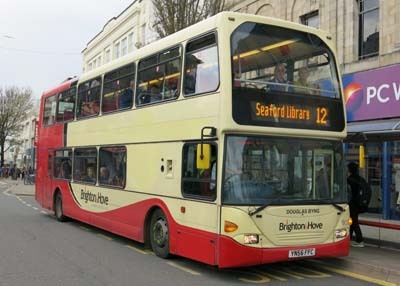 903 Scania Omnidekka - carried name since delivery in September 2006 in Metro 25 livery. 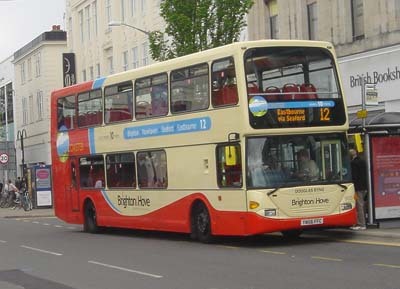 Rebranded to Coaster 12 livery in May 2008. 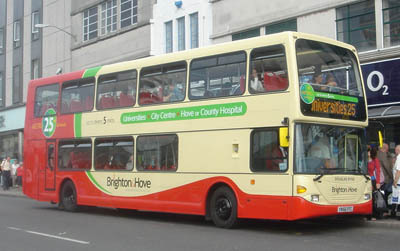 Repainted into revised Coaster livery July 2011. Coaster branding removed November 2014.